Having swept the awards scene last year with Tum Hi Ho from Aashiqui 2 and receiving acclaim for Laal Ishq (Goliyon Ki Rasleela Ram-leela), Phir Le Aya Dil (Barfi! 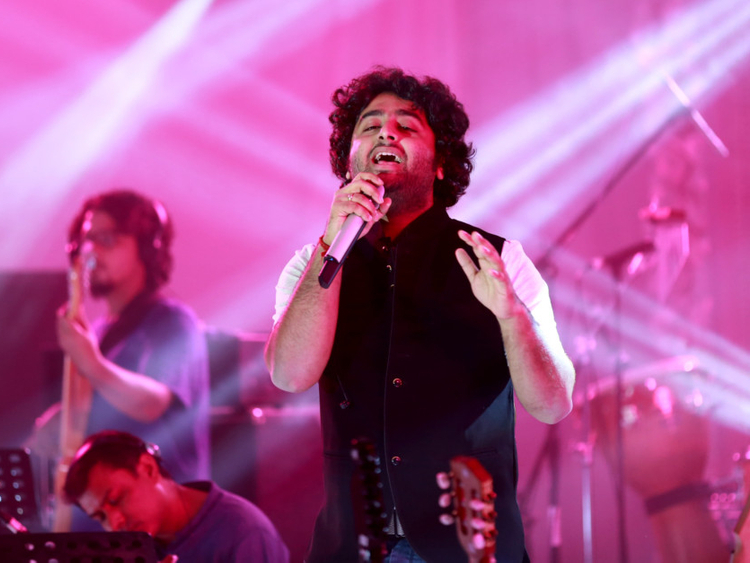 ), Samjhawan (Humpty Sharma Ki Dulhania) — to name a few — earlier this month Arijit Singh was named the Most Popular Male Singer for 2014 in an online poll. And Forbes India magazine declared him 34th on its 2014 celebrity 100 list. Yet ask the 27-year-old — whose shyness is palpable on the long distance phone call from India — about his journey from the ambitious teenager who was one of the top 10 finalists in the reality music show Fame Gurukul in 2005 to becoming the Bollywood singing sensation nine years later and he says it’s just been “routine”. “First of all I would like to say that the Forbes interview was a fake one,” laughed Singh, who will be performing to a sold-out show organised by Raging Tiger Concert Series as part of Dubai Shopping Festival. Singh will be on stage with the Grand Symphony Orchestra from London on January 15 at the Dubai World Trade Centre. “Till this interview I thought of Forbes as one of the prestigious, genuine media leader. But the kind of information that [2014 celebrity 100] report gave seemed a little weird. Anyway, that’s a different game. As for my journey, I’ve answered this some 5,000 times. It’s not really a special journey in anyway. It’s a routine that you follow. I wanted to be someone who wanted to produce music and here I am, and I’m happy about it”. After Fame Gurukul, Singh recorded a still-unreleased album by Tips music company. However, his first Bollywood release was Phir Mohabbat (Murder 2) by Mithoon in 2011, six years after Fame Gurukul. The song topped the charts and suddenly Arijit Singh was being remembered as the gawky teenager from the 2005 reality show. There was no stopping Singh then. He has sung some chartbusting songs in the last three years, including Raabta (Agent Vinod), Duaa (Shanghai), Yaariyan (Cocktail), Kabira and Illahi (Yeh Jawaani Hai Deewani), Har Kisi Ko (Boss), Main Rang Sharbaton Ka (Phata Poster Nikhla Hero), Mast Magan (2 States) … a list he’s sure to reprise this weekend, his fourth UAE show in one year. In an industry where anyone and everyone can become a singer today, with devices such as Auto-Tune, another reason for Singh staying away was to get the right training. He received his classical music training from Rajendra Prasad Hazari, whom he credits for pushing him to participate in the reality show. “If someone is trying to skip the struggle — which is the creative job — our machines today, the technology that we have, can help the person, but it is only momentary. On the other hand, if you are creative, you have the skill and you are hardworking, technology can only make you superior. You know there are advantages and disadvantages to everything. We can’t forget that at one time people worked on these huge computers, program things through C++ and Linux, now we have the Mac OX or a Windows platform. So this too is a technology progress and [the choice] varies from individual to individual,” said the singer, who’s just sung his first Tamil song after singing in Hindi, Bengali and Telugu. Though shy, the singer’s confidence is clearly visible on stage as he belts out not only his famous songs but those sung by his contemporaries. “Yes of course I sing Rahat Fateh Ali Khan, KK, Kailash Kher, Nusratji [Fateh Ali Khan] and Lataji [Mangeshkar], and even Ayushman Khurana and Benny. It’s not about who sang these songs,” explained Singh. “I like the songs and I like the singers, who’ve done such brilliant work. I cannot kill my instinct. I have always loved these songs. So now when I have the stage, I just share my thoughts and how I love music. And I see people enjoy them as much as I do because, I feel, we all somehow relate to these songs. They create nostalgia as we’ve lived with them for so many years. Ask him whether he sees himself composing such “brilliant” work in the future and he says he’s not a music composer per se.